Specialty Press/A.D.D. Warehouse, 9781937761103, 240pp. More and more often, adults are realizing that the reason they are struggling so much in their relationship is that they are impacted by previously undiagnosed adult ADHD. Learning how to interact around ADHD symptoms is often the difference between joy together and chronic anger and frustration. So The Couple’s Guide to Thriving with ADHD lays out the most important strategies couples can use – right now – to rebuild trust, fight less, disagree more productively, get the attention they deserve, and rebuild intimacy in their relationship. These are strategies honed over years of working specifically with couples impacted by ADHD, and demonstrated to change lives for the better. ‘Thrive’ is the go-to book for couples struggling with ADHD who want to actively work to improve their relationship. Melissa Orlov is a marriage consultant who helps ADHD-affected couples and also teaches marriage counselors and other professionals about effective marriage therapy for couples impacted by ADHD. She is the author of "The ADHD Effect on Marriage" and "Married to Distraction," writes for "ADDitude Magazine," and blogs for "Psychology Today" and at www.adhdmarriage.com. She speaks internationally on the topic of how adult ADHD impacts relationships, and has been interviewed on the topic of ADHD and marriage by numerous outlets, including CBS, CNN, the "New York Times," Today, "US News and World Report," and "Women's Health." She lives in Wayland, Massachusetts. 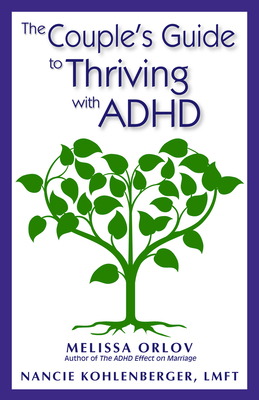 Nancie Kohlenberger, LMFT, is a psychotherapist and an ADHD adult relationship coach. She lives in Newport Beach, California.